This is very interesting. I hope there is more information available about this once the court starts releasing more information about this case. Does JSS still have the same assistant as the first trial? Read a "rumor" re Juror 17.
much more, including video of juror 17 being asked if they know the prosecutor, Juan Martinez, etc. Allegations of stabbing of Juan; comments made to him by a Jennifer Pitman, who heard court person make the comment re stabbing Juan 27 times..
@tammyharper02 @12News @Teri423 Oh I see..so that's how she gets to flap her gums and still have police protection. Wow! All kinds of unconfirmed rumors. Remember: She does not share a jail cell. She has had her contact with her supporters severely limited. Earlier, I had read a rumor of her being beaten by another prisoner, taken to jail hospital, etc..
One bad, ugly rat, IMO. Freckles wrote: Read a "rumor" re Juror 17. "sudden financial increases"??? Wondering what this little rumor is all about. Should be interesting if there is any truth to it. Personally, I hope the IRS checks into the ARIAS family fortunes! I had a neighbor whose job it was to go into the prisons and set up interviews with prisoners prior to the IRS putting liens on their properties for income tax evasion/unreported incomes from illegal sources.. .
Wow! Sooo close. She was so close to being struck. Juror 17 did give Juan cause for pause after all. He happened to notice 17's eyes tearing up when domestic violence was asked about. If JM had been aware that he prosecuted her husband she would never have been seated. One thing struck me odd on #JodiArias #Juror17 interview part1: she knew Juan from another high profile murder case but not her husband's? #JodiArias #Juror17 speaks out for first time. So #juror17 gave an exclusive interview huh? Last night's #JodiArias #Juror17 interview is up at http://TheGoldPatrol.com . What do you think so far? 2 more parts coming over next 2 days. Juror 17 has an atty! The "filmmaker" Olivia Klaus is buddies with Alyce LaViolette. This is from 2009. On June 29th Olivia Klaus, the Producer of Sin By Silence, Alyce LaViolette, MFT, and myself did a live radio interview on Patt Morrison’s show about Sin By Silence and domestic violence. I must tell you that it was amazing and it really felt good to feel as though we made a difference somewhere in the lives of those who were calling in. Sad that so many actual survivors of domestic violence/abuse got suckered by the killer and ALV. PHOENIX — A juror condemned for casting the vote that saved the life of convicted killer Jodi Arias now says her life is being threatened. Juror 17, who is not being identified because of the threats and because the names of the other jurors in the murder case have not been revealed, said she didn't try to get on the jury. "I didn't ask for this. I just showed up for jury duty," the 33-year-old mother of three said. ^^^Oh, sure, right! Even if I was to stretch my imagination far enough to believe that juror 17 didn't initially recognize Juan Martinez it is impossible to stretch it far enough to believe that nothing about Juan Martinez would have "jogged" her memory in subsequent exposures to him. He is quite memorable in appearance and mannerism. The "fog" must be contagious for some people. This juror had a responsibility to report this connection at any point-in-time during selection or trial that she realized that she knew JM and she did not. I would bet Juan is really po'd about this juror. "....Not recognizing Juan Martinez is like saying you don't recognize Mickey at Disney,' tweeted @Kristyannasmom. '#juror17...your lies and deception caused so much pain and heartache that can never be taken back!!!' wrote @tarakelley320....."
"....A man was left in “unbearable, searing pain” and scarred for life when his wife poured boiling water over him. Ken Gregory, 65, from Peterborough, sustained first and second degree burns to 14% of his body in March last year. ...."
Gilbertson is due to be sentenced on 24 March....."
PHOENIX (KSAZ) - Convicted killer Jodi Arias has basically been cut off from the outside world. Her video calls and visits have come to an end at the Estrella Jail after she was accused of misconduct. But just because she can't get her message out, it doesn't mean people aren't trying to get messages to her. Including teenagers at a Boys and Girls Club in Hawaii. A woman who works at the club decided she wanted to teach teenagers lessons about domestic violence victims, and decided to use Arias as an example. In those videos, the teens express their love and affection for the convicted murderer. Video taken by a worker at a Boys and Girls Club in Hawaii shows young people voicing their support for Arias, who they appear to be told was a victim of domestic violence. Then workers name is Jill Delos Santos, and her Facebook Page lists four different Jodi Arias Support Sites as likes. The director of the club told FOX 10 that he was aware Delos Santos shot the videos but was not aware how they were going to be used. The person who shared the videos with FOX 10 said they were played for Jodi over her recent video visits; we don't know if any of the kids parents were aware they took part. A lot of activity on twitter. I sure hope the attys and the judge are made FULLY aware of what just took place in Florida... and Ohio... and MDLR's involvement. I swear, that was intentional to try to throw the case in to a mistrial...From the get-go! Both the attys need to be sanctioned for ALL the crap they have pulled in this trial from delays, stupid appeals, secret testimony, dragging out the case, and then tampering with the case thru various and assorted means. Witness testifying and not using real name??? Say what? And then the so called testimony from New Zealand where he could not be cross examined??? JA taking the stand but refusing to resume for cross examination by the prosecution??? Those stupid sidebars because they did not know how to correctly state and objection??? I pray we never see such an inept trial ever again! #jodiarias Mitigation Specialist Cha Cha's no more. She deleted her twitter @faithwillsave4 PARTY TIME ! ! ! Maui Boys and Girls Club worker fired after #fox10phoenix report. Children supporting #JodiArias in anti-DV video. @Hgurdyman so who forced her to coerce those teens? was it those nasty ninja's again? #jodiarias all i know is it's not her fault! "@JMartinezUpdate: COMPLETE PLAYLIST for the #JODIARIAS trial. BOOKMARK THIS ONE!! :0) https://www.youtube.com/watch?v=tR0efD-8aMo&index=1&list=PLf1guQcEbGbsd9SZWDqx_z7G6kQdWw9DZ …"
@carmen_geditt MDLR is FB friends w/EDD stack (JAII memb. blocked fm chatting w/#jodiarias) U can bet she was aware of vid!! (Santos is the woman in Hawaii who took 4 vids of the kids for JA/DV. @juanstie Ruh Roh. That awkward moment when you realize there's some things even faith can't save. 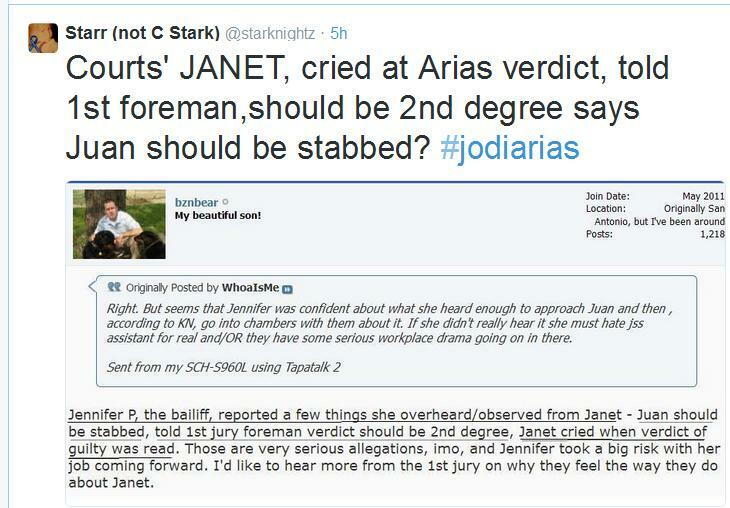 @Teri423 @juanstie Does #jodiarias hate #Nurmi so bad her fans helped set him up? $$$, MDLR and her deleted twitter account today, release of jury list with MIDDLE names which Troy Hayden said only 6 copies were made (for defense, prosecution, judge, etc), secret trust funds/IRS sniffing around.....who knows!!! So. What do you think will be the big news today? 1. FBI investigates the death threats against Juan? 2. FBI investigates and brings charges for falsely reporting death threats against JA and Juror 17? 3. Secret Service/Treasury Dept/IRS do an investigation into the unreported financial contributions to JA's defense fund BUT used for personal reasons? Failure to file proper docs? 4. MDLR/dt/JA release of juror's personal inf including ss#? 5. Nurmi/Wilnot accepting "kick-back" pay from JA's aunt (who handles finances for JA's defense fund) ? 7. Misconduct in the ENTIRE trial hence complete start over? 8. Court room person badly influenced juror 17? 9. Maybe, we will find out just how MDLR went out and bought a brand new car??? And then went shopping! BOOM! I just got the ok to break the BIG story! @bychristinebswk and I are putting together an article right now. It will be out TODAY!
. @Support @Twitter. Please suspend this account https://twitter.com/SophiaLorensky , they have posted another user's private information. Thank you.